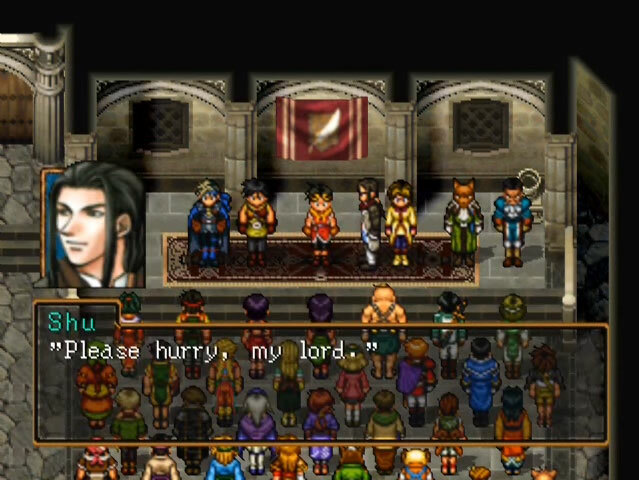 For years, I have seen people call Suikoden II one of the greatest RPGs ever made, but until recently, I had never played the series. Thanks to the PlayStation Store, I have finally rectified this issue. One hundred and eight Stars of Destiny later, I am ready to weigh in with my opinions on the game and where I think it ranks with other classic RPGs of days past. Long story short, I believe the game falls short in a couple fundamental ways, but makes up for it through (for the time) shear originality. It is a big, big cast of characters. The Suikoden series is known for its mechanic of having 108 party members to collect and use in varied capacities, and this in itself is the main reason I avoided the series for so long. I did not think it was possible to craft 108 interesting people all in one video game, and that it would likely devolve into a collectathon. Suikoden II mostly confirmed those suspicions–I never used the vast majority of the characters I collected. That being said, the game tries its hardest to give every character a unique personality (in spite of the typo-ridden localization), and I could never heap enough praise on the incredible spritework this game exhibits. All 108 characters (and another dozen or more on top of that) have distinct appearances and a range of animations, and they have even more detailed sprites with even more detailed animations in battle. The environments these characters inhabit are less impressive artistically, but they succeed in establishing a very believable feudal aesthetic that looks generally more “lived in” than that of other 2D RPGs of the era. Basically, the visuals of the game are a big success. The soundtrack, meanwhile, never stuck out to me. I do not recall any one song ever getting stuck in my head, or having an odd compulsion to hum along with anything. The audio is merely passable, to my ear at least. 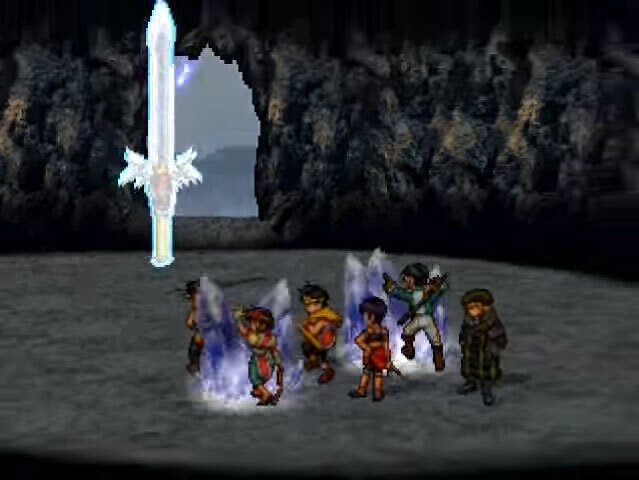 Early in the story, the protagonist and Jowy obtain the power of the Bright Shield and Black Sword Runes respectively, with each possessing great power that could turn the tide of the war. And indeed, as mentioned, the plot entirely revolves around the war. New characters are introduced into the narrative only according to how they affect the course of the war, and once the protagonist becomes Lord of a new nation himself, the war takes center stage even more extremely. Frankly, your best military strategist Shu, who is responsible for planning your every military success, is infinitely more vital to the plot than anyone else in the game. The protagonist by comparison is merely the guy who (in spite of being silent from our perspective) inspires everybody to fight their hardest. The closest thing to a character with whom we can really empathize in the game is Nanami, since she is the character we see the most who actually speaks. Jowy too is mostly sympathetic, except we do not see him often and some of his motivations are a little illogical. Otherwise, everyone else just comes and goes in the story, with some characters holding a little more importance than others. In the end, everything is about the war, fealty, and fallout. The result is that I never cared too deeply about any one character, which means I never fully invested myself in the story. On the flip side though, I must admit I found myself highly endeared by an RPG plot that chose to focus exclusively on one not-extremely-large conflict. I was genuinely surprised that the final dungeon of the game is just a regular castle, and not some chaotic abyss at the edge of reality as one would expect in a Final Fantasy title. 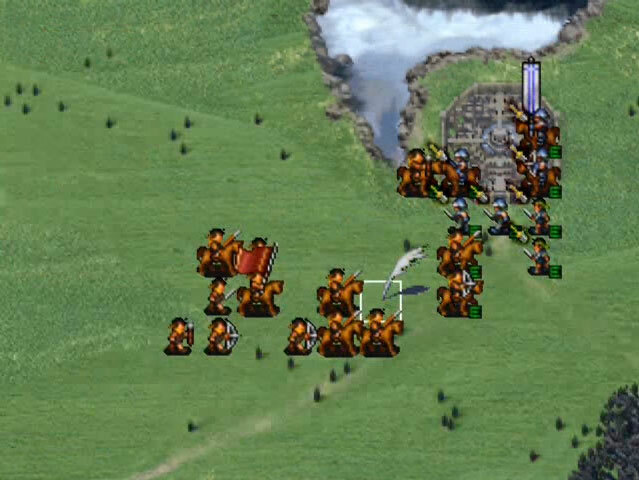 It is not the entire world you are trying to save in Suikoden II–only one region. And once you have saved it, the credits come rolling. Oh, It’s Tactics Ogre Too! You will have to take my word for it that this is a dramatic confrontation. Combat notably occurs in three different forms in this game. There are traditional turn-based battles, one-on-one duels, and actual grid-based strategy RPG battles. The duels are really just high-stakes rock-paper-scissors games, but the other two warrant discussion. The turn-based combat allows for six party members distributed across a front and back row, and certain characters can combine their turns with others to use special attacks, Chrono Trigger-style. Having a huge party allows for a huge number of ways to approach combat, but the game is ultimately pretty easy regardless. I just picked characters with the highest HP and strength and made sure to keep a couple healers on hand, and I almost never required anything else. Frankly, too much of the game can be conquered with the “Auto” battle option, and I ended up viewing the combat as an inconvenience more than anything. As for the strategy RPG battles, most of them are not real battles, but rather just a stage through which more plot events unfold. That is fine, as the game squeezes a lot of terrific drama out of these scenes. In fact, there is genuine strategy employed by your man Shu in all of these battles, strategy ostensibly so clever and brilliant that it makes me wonder if the game developers spent a lot of time studying actual wars in history. It is a really refreshing attention to detail. When you actually are playing the strategy RPG segments though, they tend to be pretty basic–defeat the leader or infiltrate the enemy headquarters is usually as complicated as it gets. By the end, your army consists exclusively of Stars of Destiny, some of whom are largely useless, while others have attacks so overpowered that they can win battles all by themselves. As a result, these battles tend to be fun diversions, but again offer little challenge. In Suikoden II, you really need to just be “along for the ride” in order to have fun with it, because it is not going to offer any Shin Megami Tensei-caliber difficulty. Worth noting before concluding though is that there is more to do in the game than fight people and collect new party members. For instance, you can gamble, fish, and learn to dance, all courtesy of your various party members. The more people you collect, the larger your domain becomes and the more arbitrary options become available to you (like being able to change the display style of text boxes). I had Internet help to find all the characters though; I could have spent frustratingly far beyond the 53 hours I played locating everybody otherwise. The Japanese role-playing game will always be my favorite video game genre, and after having played it, I would not include Suikoden II among my favorites in the genre. The regular combat is too easy and dull, not as engaging as that of Chrono Trigger or Phantasy Star IV for instance, which also make use of diverse parties with combination attacks. The plot focuses too much on war for any of its myriad characters to stand out, which becomes more problematic when you consider the example that Final Fantasy VI‘s large cast is spectacularly memorable in its entirety. The only area where Suikoden II indisputably succeeds is with its atmosphere. Its world just feels real. The stakes feel real. The game dares to be stingy about its scope compared to other RPGs and does so to terrific effect. That does not make it one of the best RPGs ever though. Of course, I already know lots of people disagree harshly with me on this subject, so I would love to hear alternative opinions. Lay ’em on me if you have them, please! hey love the review but have to disagree with you it’s my number one classic RPG but really nice review man check mine out! Hey I’m sorry you didn’t feel connected to the characters! You’re right that most 108 are fillers to expand the world, but I felt so impacted by the conflict regarding MC, Jowy and Nanami. I think equally important as the large scale plot of the war is the interpersonal drama between those 3 characters. Thanks so much for reading, and for the kind words, Matt! Suikoden II really impressed me in ways I wasn’t expecting. If I weren’t so busy, I’d try to make time to play the others. I’m using my scarce free time right now to work through Final Fantasy XV and World of Final Fantasy.